Nominated for seven Oscars, including Best Picture, and winner of two (Actress and Original Screenplay), this "darkly amusing" (Los Angeles Times) thriller combines a "first-rate cast" (Variety), "a dazzling mix of mirth and malice" (Peter Travers, Rolling Stone) and an unusual kidnapping plot that unravels the Midwest like never before. Jerry (William H. Macy), a small Minnesota town car salesman, is bursting at the seams with debt … but he's got a plan. He's gonna hire two thugs (Steve Buscemi and Peter Stormare) to kidnap his wife in a scheme to collect a hefty ransom from his wealthy father-in-law. It's gonna be a snap and nobody's gonna get hurt … until people start dying. Enter Police Chief Marge Gunderson (Frances McDormand), a coffee-drinking, parka-wearing - and extremely pregnant - investigator who'll stop at nothing to get her man. And if you think her small-time investigative skills will give the crooks a run for their ransom … you betcha! Although I don't tend to like movies made by siblings, I must admit that I found Fargo by Joel (writer/director) and Ethan (writer/producer) Coen to offer a fairly compelling film. That's not always been the case, however, as I once regarded Fargo as a minor victim of high expectations. I didn't see the film until it'd bopped around theaters for a while and finally hit the bargain circuit. By that point, I'd heard a great deal of praise for it, and since it seemed to be my kind of movie, I expected it to offer a fantastically fascinating experience. That didn't happen. As I recall, I thought Fargo was interesting and mildly entertaining but it seemed radically overrated. Actually, I still think the film's reputation exceeds its worth - no way this sucker should be on the AFI 100 list - but I like it a bit more than I did when I originally saw it in the mid-Nineties. Clearly general audiences will never embrace Fargo, as it's simply too odd. On the surface, it's a fairly straightforward "cops and robbers" kind of picture; heavily in debt, Jerry Lundegaard (William H. Macy) convinces some low-lifes to kidnap his wife. Her father will pay the ransom and they'll split the money. Simple, right? Of course, complications ensue and the body count escalates. Eventually heavily pregnant small town police chief Marge Gunderson (Frances McDormand) becomes involved in the case. It's in the execution of the tale that Fargo differs from other, similar stories. From the comically-overemphasized Minnesota accents heard from most of the main characters to the haplessness of so many of the participants to the extreme oddity of a nearly-due pregnant police chief, Fargo tosses a lot of strange stuff into the mix. Many times, films that work this way tend to be weird just for the sake of trying to be different; for example, I watched Drowning Mona tonight and found that the movie's humor didn't work because it was so self-consciously wacky. 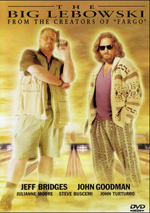 The Coen brothers often run that same risk and have encountered those problems in some of their other pictures; I thought The Big Lebowski was a total disaster due to this high level of forced nuttiness. For the most part, the humor in Fargo succeeds and barely stays on the side of cleverness without too much obvious silliness. Part of that stems from the fact the characters aren't as idiosyncratic as those in similar kinds of films. In fact, most of them - Jerry, Marge, and their friends and families - are about as nice and pleasant as one could hope. It's from that plainness that much of the humor stems; so much of the story is handled in a matter of fact manner that the contrast becomes entertaining. Even the kidnappers - wiry Carl (Steve Buscemi) and silent Gaear (Peter Stormare) - aren't particularly eccentric characters; though Carl's easily the most hyper of the bunch, considering the slow and laconic demeanors of so many of the others. Fargo is a black comedy but remains hard to categorize in other ways. One mistake is to expect the film to offer a laugh riot, because most of the humor tends to be droll or wry and doesn't lend itself to hysterics. Most of the fun comes from the characterizations, actually, and they're uniformly strong. I don't think McDormand deserved an Oscar for her work as Marge simply because she seems too cartoony and broad a character, but I still liked her work; she makes the role such a strong presence in the film that it's funny to think she doesn't enter until more than a third of it has gone. I always like Macy, and he gives Jerry his usually wonderful hangdog aura. Macy does tired defeat better than anyone in the business, and he makes Jerry much more sympathetic than he should have been; he seems like such a nice guy that even though he's committing a crime, I couldn't help but root for him. Buscemi and Stormare aren't sympathetic at all, but they have strong chemistry together and make an effective pair, especially since the two are completely opposite in almost every way; the contrasts add to the effect. Ultimately, I enjoyed Fargo and think it has a lot to offer. I admit I still don't believe it deserves all of the fuss it's received over the years but feel it's one of the Coen brothers better films. It's an entertaining and clever piece that avoids the self-consciously wacky pitfalls that often mar this kind of project. 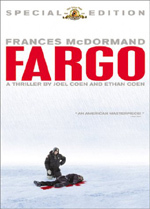 Fargo appears in an aspect ratio of approximately 1.85:1 and in a fullscreen version on this double-sided DVD-14; the widescreen image has been enhanced for 16X9 televisions. Only the letterboxed edition was viewed for this review. Although not without some concerns, in general I thought this transfer looked solid. Sharpness demonstrated limited issues. A few shots seemed a little soft, but only a couple instances of that sort arose. The majority of the movie came across as well defined and distinctive. Some mild edge enhancement showed up at times, but I saw no concerns related to shimmering or jagged edges. Print flaws stayed at a minimum. A speck or two cropped up but otherwise the movie remained nicely clean. Not surprisingly, the palette used in Fargo appeared pretty subdued. It's a snow-dominated landscape, so whites and various earth tones filled most of the film. All of these seemed well-reproduced, and when we saw brighter colors, they appeared clear and accurate; for example, the nighttime scene in which red lighting from car tail-lights featured prominently looked nicely clean and lacked any signs of noise or bleeding. Since the movie was so starkly lit much of the time, black levels became more prominent than usual, and they looked solid and deep, with no murkiness or tentative qualities. Shadow detail appeared excellent; throughout the low-light scenes, I found the all of the image to be readily viewable with no problems related to excessively heavy or thick darkness. Lose the light edge enhancement and occasional soft shot and Fargo reached “A” level. As it stood, it earned a solid “B+”. 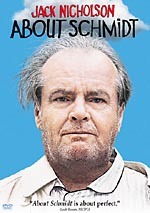 Although I expected this DVD to offer the same image as the version released in 2000, the special edition appeared to present a different transfer. I came to that conclusion because the new one lacked evidence of the minor print flaws that showed up in the prior release. The differences weren’t enormous, but the 2003 version presented the superior picture. Audio quality remained the same, which was fine since the old disc got the job done in that category. The disc included a fairly effective Dolby Digital 5.1 soundtrack. Since this wasn't exactly a rootin'-tootin' action movie, the soundfield seemed fairly subdued. However, it provided a nicely involving atmosphere. The forward spectrum dominated and displayed some good stereo imaging. Each of the three speakers offered a lot of activity, and the material blended well between the channels to create a lively impression. The surrounds mainly stuck to reinforcement of the front speakers, but they made the mix more immersive, especially during segments like the wood-chipper scene. It's a modest soundfield but one that suited the film. As for the quality of the audio, it's generally a well-recorded affair. Dialogue displayed slight edginess on a few occasions, but it mostly appeared natural and distinct, with no issues related to intelligibility. Effects were clear and realistic, while the score sounded smooth and bright. Overall, the track boasted solid dynamic range and could pack a decent punch when necessary. Ultimately, the mix worked very well for this movie and earned a “B”. This new special edition release of Fargo tosses in a mix of extras. We open with an audio commentary from director of photography Roger Deakins, who offers a running, screen-specific track. The piece seems fairly dull overall. Not surprisingly, Deakins mostly focuses on technical issues. He discusses visual elements like locations, storyboards, production design and shot composition. Deakins also gets into a few general topics like working with the Coens. Not much of this adds up to a lot of anything. Deakins provides a moderate number of useful details, but I don’t feel like I really learned much about the making of the flick. In addition, quite a few empty spaces marred the presentation and made it rough going at times. Dedicated Fargo fans might want to give this a listen, but otherwise it seems eminently skippable. Next comes Minnesota Nice, a 27-minute and 46-second documentary about Fargo. It presents the usual combination of movie clips, images from the set, and interviews. We hear from producer/co-screenwriter Ethan Coen, director/co-screenwriter Joel Coen, actors Frances McDormand, Steve Buscemi, William H. Macy, and Peter Stormare. These comments seemed to come from a mix of new and archival discussions. Overall, “Nice” presented a very solid look at the film. We learned a little about the project’s genesis and its “true” nature, and we also got good notes about the actors, their characters and the approaches used for them, working with the Coens, reactions to the flick, and other elements. The participants seem to be nicely frank about their experiences, and they also come across as entertaining and informative. Macy provides some particularly amusing pieces. Though a little short, “Nice” gives us a good program. We follow this with a segment from The Charlie Rose Show. 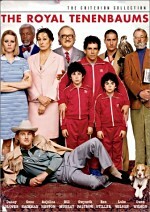 Aired back in 1996, the 20-minute and 31-second piece features interviews between Rose, the Coen brothers and McDormand. All four say together for this round-table discussion. They go over some general topics related to the film such as how the brothers work, the alleged factual basis of the story, and the Coens’ general practices. Rose fawns and praises too much and a lot of the material appears elsewhere. The interview tosses in some intriguing tidbits but seems a bit superfluous. As with many MGM discs, Fargo presents a trivia track. These efforts can be very hit or miss, but this one’s quite good. It covers topics about the making of the film, the background for its story, facts about its participants, and notes about related subjects. For example, we learn a little about Minnesota, kidnapping, and other areas connected to the film. We even find out what each part of a Vehicle Identification Number means! It’s a lively and informative piece that offers some fun material. A few small pieces round out the DVD. In the Photo Gallery we find 69 stills from the set. Nothing terribly interesting pops up here, but it’s a decent little collection. In addition to the film’s theatrical trailer, we find a TV spot and a promo for the special edition DVD of Blue Velvet. We also find a pretty informative text article from American Cinematographer plus some brief production notes in the package’s booklet. Note that most of the extras appear solely on the widescreen side of the disc. The fullscreen side duplicates the audio commentary, trivia track, trailer, and Blue Velvet ad. In the special features menu of both sides, you’ll find a very minor Easter egg. Highlight “audio commentary” then click left. This accesses a snow globe; press “enter” and you’ll get an alternate menu background. I’ll never consider Fargo to be a great film, but it offers an entertaining and unusual piece. It occasionally seems a little self-consciously nutty, but it usually avoids those problems and comes across as witty and enjoyable. This DVD offers very good picture quality along with solid sound and an erratic but mostly interesting set of extras. I’d definitely recommend this special edition DVD to those who don’t own the prior MGM release from 2000, especially since the latter’s no longer in print. What about those folks who already bought the old one? I thought the 2003 version presented superior picture quality, but this wasn’t an enormous difference. It also included many more extras, which was the most substantial upgrade. If the supplements interest you – or if the small picture quality boost is important to you – then this special edition disc merits your money.